The time is the modern day. 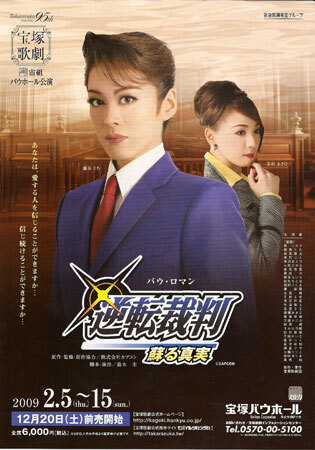 The main character is Phoenix Wright, a lawyer who has set up a small office in crime-filled New York. One day, the murder of a senator is reported on the news. Phoenix is shocked. The prime suspect, Leona Clyde, was Phoenix's former lover. Leona had been Phoenix's classmate since they were young and became a lawyer because she wanted to aid the weak. Believing in Leona's innocence, Phoenix takes her case. But Leona stubbornly insists that she is the culprit. She has coldly closed off her heart and is no longer the smiling figure she once was. Though he believes in Leona's innocence, a great hurdle is blocking Phoenix's way. Bringing the case against Leona is a cool-headed and gifted prosecutor, a man who is rumored to stoop to any means for a guilty verdict — Miles Edgeworth. In truth, Miles was also a classmate of Phoenix's when they were young. The trial begins. The three old friends are reunited in the courtroom. Phoenix battles to reach the truth, believing in Leona's innocence. But at the moment he thinks he has proved her innocence, an unforeseeable tragedy is waiting... How will Phoenix turn around this desperate situation? Will Leona open up her heart once more? Will Miles insist upon proving an old friend guilty? Please look forward to the story of Phoenix, a man who believes in people and strives to find to the truth. --from this page; any mistakes, awkwardness or taking of liberties in the translation can be blamed on lokai. Final performance for Souma Neo. Takarazuka Kagekidanâ€™s GYAKUTEN SAIBAN Review - Review by Faith A.K. Created by lokai. Last Modification: Wednesday 09 of July, 2014 12:50:20 PDT by fred_ojousan.